Why This New York Tragedy Still Matters, 107 Years Later — Most Prominent Co. | Blog - Most Prominent Co.
“On March 25, a Saturday afternoon, there were 600 workers at the factory when a fire began in a rag bin. The manager attempted to use the fire hose to extinguish it, but was unsuccessful, as the hose was rotted and its valve was rusted shut. As the fire grew, panic ensued. The young workers tried to exit the building by the elevator but it could hold only 12 people and the operator was able to make just four trips back and forth before it broke down amid the heat and flames. In a desperate attempt to escape the fire, the girls left behind waiting for the elevator plunged down the shaft to their deaths. The tragedy that is now known as the Triangle Shirtwaist Factory Fire— recounted above by History.com— only lasted 18 minutes. But what took the flames only 18 minutes to destroy wasn’t built quite as fast. Years of subtle decisions made by factory owners, consumers, and the norms of the garment industry contributed to the disaster— and we’re still learning from those mistakes today. 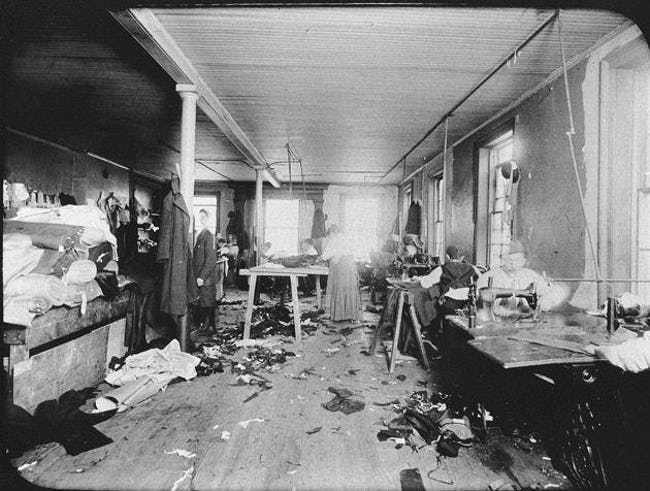 But here’s a fact that may surprise you: In 1911, the Triangle Shirtwaist Factory wasn’t actually considered a sweatshop. In fact, it was a modern facility for the time, that was only 10-years-old at the time. The horrific fire happened where people least expected— all while costs for clothing were continually lowering, and consumers weren’t asking why. The fire—and the resulting death of 146 young, immigrant women— spurred many garment workers and politicians to action, resulting in many of the worker-safety regulations and laws we’re familiar with today. This was one of the events that contributed to the start of the Factory Investigating Commission, New York State Department of Labor, unions, building codes, child labor laws, and minimum wage requirements. In the United States, where the Triangle Shirtwaist Factory Fire occurred, modern legislation protects against a tragedy of this nature happening again. However, many garments are now made overseas where there often aren’t regulations keeping modern day garment-workers safe. In fact, another garment industry tragedy, the Rana Plaza Collapse, was as recent as 2013. “Today most Americans know a mostly accurate, if jumbled, account of the Triangle Waist Company factory fire, but few realize the role of consumers in the death of the 146 workers. The women in the factory made ready-to-wear clothing, the shirtwaists that young women in offices and factories wanted to wear. Their labor, and low wages, made fashionable clothing affordable. Seeking efficiency, manufacturers applied mass production techniques in increasingly large garment shops. Entrepreneurs prospered, and even working-class people could afford to buy stylish clothing. This statement begs the question— is getting a great deal on a new shirt really worth it? It was true in 1911, and still is today— if we, as consumers, aren’t paying for what our clothes are really worth, someone else is. Similar to the Triangle Shirtwaist Factory Fire, garment workers around the world are still making up the difference for consumers to score a great deal— even 107 years later.